Veteran Journalist Helen Thomas Leaves An Outspoken Legacy In her long career, Thomas broke barriers and became a White House fixture — but her famous bluntness caused her downfall in the end. She died Saturday morning at the age of 92. Veteran White House correspondent Helen Thomas broke barriers and became a White House fixture, but her famous bluntness caused her downfall in the end. 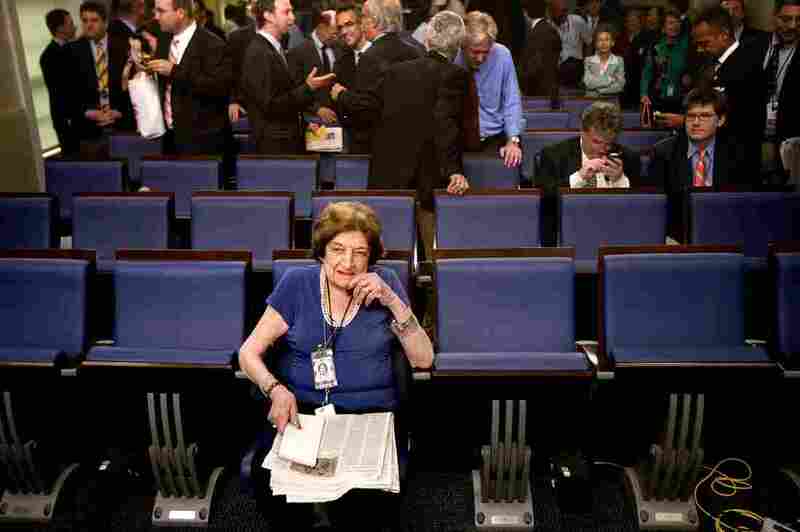 Journalist Helen Thomas died Saturday at the age of 92, according to The Gridiron Club & Foundation. Over the decades, she made her mark as a woman journalist who shattered barriers in the nation's capital and as someone who invariably spoke her mind. She became a fixture at the White House, too, but her career came to an ignominious end due to her bluntly expressed opinions — especially her criticism of Israel and Jews. Thomas was a trailblazer and gadfly. Had she stepped away after the first six decades of her career, she would have been hailed simply as one of the most famous White House reporters in modern times. "It sounds glamorous, and it is — and it's a wonderful job — but there's a lot of legwork involved in doing it well. And Helen was committed to doing it as well as anybody," former Associated Press reporter Jennifer Loven says. Loven and Thomas met while Loven was working as an intern in the early 1990s. She retained her awe for Thomas as she rose to be a full-fledged White House correspondent for the AP. Even after decades on the job, Loven says, Thomas continued to scramble after stories, and yet took time to mentor a younger woman who was reporting for a rival news agency. "You know, there is a confederation among journalists that you help each other up until the moment when you have to beat the crap out of each other," Loven says. "And she was true to that." Thomas was born in the small town of Winchester, Ky., the daughter of two Lebanese immigrants who arrived in the U.S. with less than $20 in their pockets. Soon after her birth, the family moved to Michigan. Altogether, the Thomases had nine children. Helen Thomas went to public schools and then to Wayne State University. She later became a cub reporter in Washington, D.C., and a chronicler of so-called "women's issues," before covering various federal agencies for what was then United Press. She covered Democratic presidential candidate John F. Kennedy on the campaign trail, then followed him to the White House, where she continued to report for nearly five decades. Her sign-off at the end of press conferences, "Thank you, Mr. President," became so well-known it was included in movies about White House intrigue. "When I started in 1989, Marlin Fitzwater, who was the press secretary at the time, said to me, 'Now B. Jay, when you come in, Helen's going to be sitting on the bureau outside my office.' I said, 'Yes, Sir.' He said, 'She's going to ask you questions.' I said, 'Yeah.' He says, 'Don't answer them. Don't say anything, because anything you say will be the top of her story.' "
Thomas was the first woman to join the White House Correspondents' Association, and the first to join the Gridiron Club. She pushed hard for entry, knowing both professional groups provided validation for reporters in D.C.
"Well, I know we're being accused of overkill, but I think that the aggression in the aftermath of being lied to for nine months, where everything was inoperative that they said, and we were the transmission belt, a certain disillusionment does set in, and we all realized that we were not aggressive enough. We didn't ask enough questions." In 2000, United Press International was sold to the Rev. Sun Myung Moon of the Unification Church. Thomas wanted no part of him. She became an opinion columnist for Hearst Newspapers, unshackled from notions of journalistic objectivity, but still present in the White House press room. "What does the president mean by 'total victory?'" she asked White House Press Secretary Scott McClellan in a memorable exchange from 2005. "We'll never leave Iraq until we have total victory? What does that mean?" "When you engage in a war, you take the fight to the enemy," McClellan replied. "You go on the offense. And that's exactly what we're doing. We are fighting them there, so that we don't have to fight them here." McClellan began to talk about what the administration learned from the Sept. 11 attacks when Thomas interrupted. "Iraq had nothing to do with 9/11," she said. Her outspokenness occasionally inspired controversies that would flare up for a day or two and then subside. But it took only 30 seconds in 2010 to dislodge her, at the age of 89, from the perch in the White House press corps she prized so deeply. A rabbi at a Jewish heritage day celebration, held on the White House lawn, asked Thomas if she had any comments on Israel. "Tell them to get the hell out of Palestine," she answered. When asked, "So where should they go? What should they do?" she replied, "They'd go home — Poland, Germany." It was a particularly galling jab, given how many Jews were driven from or murdered in those two countries during World War II. Hearst announced Thomas' retirement soon after the video was posted online. She eventually took a position as a columnist at a small Virginia paper, but her voice would be little heard from again. Thomas' fans and former colleagues offer no defense of those remarks that day, but say her legacy is being wrongly overshadowed by the incident. "She stood up and she asked the questions that are hard to ask, that are challenging," Loven says. "You could find clip after clip after clip of White House press secretaries standing up at the podium and saying, 'Well, Helen, I reject the premise of your question,' which she invariably found insufficient, and would tell them so immediately." The audio and a previous Web version of this story contained errors related to Thomas' comments during a Jewish heritage day celebration. Thomas was not asked if she had a message for the Jewish people; she was asked if she had any comments on Israel. Her response was, "Tell them to get ... out of Palestine," not out of Israel.